Scream Season 2018 Opening Night Will Be Friday October 5th!! After the Spooky Fun – Join Us at Brewsky’s Bar by the Fire Pit! Beware of the Quarrymen who still roam the mountain, waiting to exact revenge on the unknown strangers who destroyed them. IT’S NOT SAFE TO BE ON THE MOUNTAIN AFTER DARK…BEWARE! NO RESERVATIONS NECESSARY UNLESS YOU HAVE A GROUP OF 20 OR MORE. TICKETS ON SALE AT 6:30 – LIFT STARTS AND FIRST WAGON GO ABOUT 7PM! Too scared to do the Haunted Hayride? Not sure if the kids are ready for the real thing? Try our Starter Haunted Hayride! Each night at 6:00pm we will do the hayride while it is still light out without any actors in the woods. This hayride will allow you to enjoy the hayride and all the Amazing Halloween Scenes without anyone sneaking up on you. Just $10 per person! CALL: 610-287-7900 TO MAKE A RESERVATION TODAY! Take a chilling chairlift ride up the dark side of the mountain and work your way down the winding and dimly lit trail. Your reward when you make it down? A Haunted Hay Ride will be waiting to continue your journey, to the remains of the Quarrymen murdered in their sleep.NO RESERVATION NECESSARY UNLESS YOU HAVE A GROUP OF 20 OR MORE. TICKETS ON SALE AT 6:30. LIFTS START AND FIRST WAGONS GO ABOUT 7PM. The Full Heart of Darkness Tour includes (7 zips,4 challenges, 2 rappels, and a cargo net climb in the dark with a headlamp! 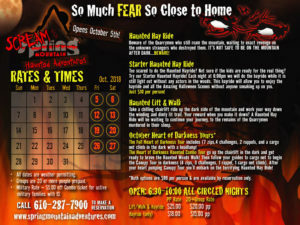 The Heart of Darkness Haunted Combo Tour go up the chairlift in the dark and get ready to brave the Haunted Woods Walk! Then follow your guides to cargo net to begin the Canopy Tour in darkness (4 zips, 3 challenges, 1 rappel, 1 cargo net climb). After your heart pumping Canopy Tour you’ll embark on the terrifying Haunted Hay Ride! *Both options are $99 per person & are available by RESERVATION ONLY. CALL: 610-287-7900 TO MAKE A RESERVATION TODAY! RESERVATIONS ARE REQUIRED FOR ZIPPING! All dates are weather permitting. Groups are 20 or more people pre-booked. Call 610-287-7900 to reserve your group!